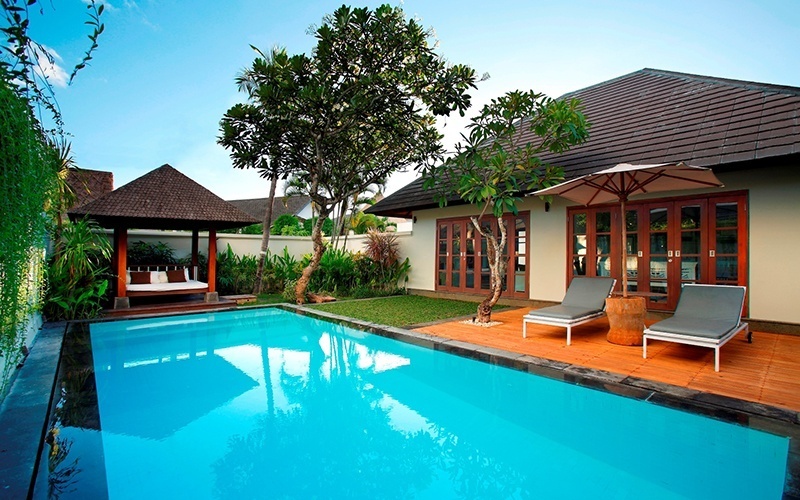 Located in Bali’s fashionable shopping, restaurant, and bar district of Seminyak, Nunia Boutique Villas offers privacy and serenity within its vicinity and spacious quarters furnished with comfortable and earthy decor that elegantly contrasts with pristine white fixtures. Each villa has a lap pool which is shrouded by a well kept garden providing appropriate seclusion and is built upon the steps of a hardwood sundeck and shady gazebo with soft bedding. Situated at the centre of the island, the villas are a walking distance from Petitenget beach as well as other attractions and landmarks like ‘Eat Street’, Petitenget Temple, and Ku De Ta, which is one of Asia’s most distinctive lifestyle destinations.